Two of our more sporadic members arrived early and were keen to get as many games played as possible, so the first game was squeezed in between ordering food and its arrival. As something quick was required and Turquoise hadn’t played it before, NMBR 9 was the perfect choice. A quick rules explanation was necessary, but there isn’t much to explain so it didn’t take long: one player turns over the card deck, one at a time and everyone takes the indicated card and adds it to their tableau, ensuring that the edge touches one of the other tiles. Once a few tiles have been placed to form a base layer, then tiles can be placed on top of other tiles as long as there are no overhanging parts, and the tile sits squarely on more than one other tile; the higher the tiles are placed the more they score. It was a tight game, well, tight between three players, but Pink romped away with it, twenty points clear, thanks to building one more level than everyone else. Food was a little delayed, so there was time for another short game, this time an old favourite, 6 Nimmt!. This is a game that gives players the illusion of control while everything is going well, and then shatters that illusion when it all goes wrong. It is one of those games that is more difficult to explain than to play, but essentially players simultaneously choose a card from their hand, then simultaneously, everyone reveals their card. Beginning with the lowest, each card is added in turn to the end of one of the four rows of cards on the table. If a card is the sixth to be placed in a row, the first five are “won” and the card becomes a new starting card. The player with the fewest “nimmts” is the winner, though almost as much kudos goes to the person for whom the game goes most wrong and ends up with the most “nimmts”. As usual, we played two rounds, and Magenta won the first with a duck, while Purple top-scored with twenty-six. Purple picked up more “nimmts” than anyone else in the second round too and bravely took the wooden spoon, but the winner is the lowest over two rounds, and when Magenta picked up thirteen in the second round, she left the door open for Turquoise who finished with a very creditable total of six. While Pink, Blue, Magenta and Turquoise munched their pizzas, and Burgundy was attacked his ham, egg and chips, there was just time for those not eating to play a quick game of Love Letter. This game is very, very simple and can be as long or as short as necessary, in fact we hardly ever actually play it to the bitter end (three wins for one person). Players start with a one card in hand and, on their turn draw a second, then choose which to play. Each card has a special action and the aim of the game is to be the last player remaining or, in the case of more than one player left standing, to finish with the highest value card. The first round went to Ivory came out on top, but in the second, Green made a lucky guess and knocked out Ivory in the first turn. Then Green lost on a comparison, leaving Black and Purple to battle it out to the last card, with Purple the victor. The third (and as it turned out, final) round ended up in a very unusual situation of being a tie between Green and Purple who both had the same high card. While checking the rules, Blue shouted across that the winner was the one who had the highest total in front of them, which gave victory to Green. With one-a-piece (except for Black) it was declared a three-way tie, though Purple was able to claim a moral victory with one win and a lost tie-break. Burgundy was still wading through his ham, egg and chips, but everyone else was finished, so it was time to negotiate who was going to play the “Feature Game”. This was to be Taluva, a game we’ve played before, but this time it was to include the Extension. 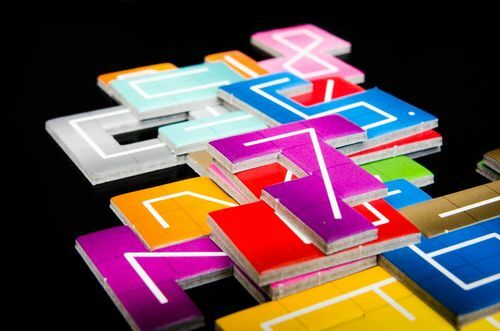 The base game is a fairly simple tile laying game with a surprising amount of depth. The idea is that on their turn, players place their tile, then place a building then replenish their hand. This procedure is to that of Carcassonne, but that is where the comparison ends. The tiles are a strange dodecagon made of three hexagonal regions or fields, one of which is always a volcano. When placing tiles, they can be adjacent or on top of other tiles so long as the volcano sits on top of another volcano (the tile must also cover more than one tile and there cannot be an overhang). Buildings can be placed anywhere, provided that they obeys certain rules. Unfortunately, although the game is beautiful, the theme is a bit sparse making these rules appear very arbitrary which has the consequence that they are quite difficult to remember. A hut can be built on any unoccupied level one terrain that isn’t a volcano. On the other hand, an existing settlement can be expanded by placing huts on all adjacent terrains of one type, with more huts placed on the higher levels (two on the level two etc.). There are also three temples and two towers to place which can only be added to existing settlements: temples must be added to settlements covering at least three fields, while towers must be placed on a level three field adjacent to a settlement of any size. The game ends when there are no tiles left and the winner is the player to have placed the most temples at the end of the game. In case of a tie, the number of towers built counts and then the number of huts. However, if a player succeeds in building all buildings from two out of the three different types before the game end, then he immediately wins the game. On the other hand, any player who squanders his building pieces and is unable to build any more is immediately eliminated. Adding the Extension adds four optional modules: pieces for a fifth player; two ships per player; a small number of double-hex tiles (rather than triple-hex tiles), and a board that provides a boundary for the building area. We added all four modules, though we used the largest boundary area so it had only a small impact on the game. The double-hex tiles are laid out face up and each player can only use one during the game, but as all tiles must be used unless a player checks-out early, the decision when to take play one can be quite important as nobody wants to be left with a tile they can’t use effectively. Perhaps the most interesting module, though, is the ships. These are played on “lagoons”, but critically, there is a limit of one ship per lagoon, and the ships do not connect other areas. From the very start, everyone seemed to get carried away with the idea of trying to build lagoons and place their ships. Everyone that is except Burgundy, who got his first settlement illegally removed by Blue and spent most of the rest of the game trying to catch up. Meanwhile, Pink stalled as his computer overheated, trying to come up with a strategy to compete with Ivory’s ever-growing empire. It quickly became apparent that it would require everyone else cooperating to bring it down. Burgundy and Blue tried to hatch a plan, but Black couldn’t see a way to prevent Ivory placing his last ship, and wasn’t prepared to spend as long thinking about things as Pink. And with that, Ivory brought the game to an end; definitely far more “thinky” than such a simple little game really had a right to be. Meanwhile, those who did not want to play long or heavy games chose a light game of Best Tree House, an easy game to learn (or so we thought). This is a fairly simple little card drafting game, but with the rules in German, it was down to Purple to try and remember how to play it and Magenta to attempt some translation. Players start with a hand of six room cards, and simultaneously choose one to add to their tree, passing the rest of their hand on to their neighbour. There are some rules about building: firstly, treehouses must be built in such a way that each new level has one more card than the last (giving the tree its shape). Each card represents a type of room and these are colour-coded to one of six colours. 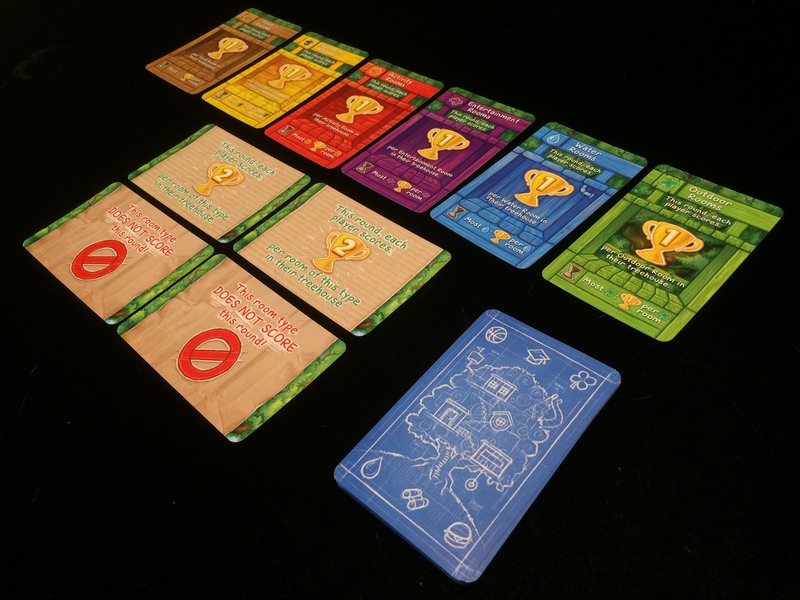 When a player is adding a card of a colour they don’t have in their treehouse yet, it can go anywhere, but if a player is placing a colour that already exists in their treehouse, it must connect to at least one card of matching colour. In this way players have to consider their card placements over the course of the game and try to avoid locking themselves out of options as play develops. The clever part is the Balance Marker which limits the placement options. It has three positions and when it is not central, the player cannot build on that side of their treehouse, indeed, they have to build to the other side of center in order to move their Balance Marker back to open up their placement options again. At the end of each round, players score their treehouse based on the trophies on display. We stumbled through the first game not entirely sure who should chose the scoring alteration cards after each round. It wasn’t till the end of the game, when Black had found a copy of the English rules online for us that we realised we had made a few mistakes in the way we played. Some of us had also re-used a colour that should not have been used as it had already been blocked by other rooms. Although the game was a tie between Purple and Turquoise on thirty-four each, we felt we had made such a mess of it that we needed to try again, but properly this time—it was only a short game after all. The second time round, the game made more sense and everyone made better choices. The choosing of the score alteration cards was certainly trickier this time, but that felt more like a game challenge. This time the victory went to Magenta, but everyone felt better after the second try and the game seemed a lot fairer too. Although time was getting on, it still wasn’t that late, and the “Feature Game” looked like it might be drawing to a close soon, therefore we picked another short one, Dodekka. This is a simple little push-your-luck card game, with five different suits, Fire, Earth, Air, Water or Ether each with cards numbered 0-4. The game starts with three random cards placed in a line from the draw deck. On a player’s turn they can either take a card from the deck and add it to the end of the row of cards, or take the card nearest the deck. If the total of the face values of the cards in the row exceeds twelve, then the player has to take the whole row. At the end of the game, players choose a scoring suit and add up the face value for that colour, then they subtract the penalty points – one for every card not in their scoring suit. Purple and Green are old hands at this one, but Turquoise and Magenta had not played it before. Green made a good show of demonstrating how not to play this game as he managed to collect a vast array of cards of all colours. His positive score was not bad, but he had a shockingly high negative score giving an overall minus one. It was much closer between the other three. Turquoise got to grips with the idea quite quickly and managed to amass a high positive score of 16, but ended up with a few too many other colours. In a game that is often won with a score of two or three, her score of nine was excellent and remarkably tied with Purple who scored. Eclipsing them both, however, was Magenta, who scored positive thirteen like Purple, but amazingly had avoided the traps and ended up with only two other cards to give an unheard-of total score of eleven. By this time, Taluva had finished, and that group had moved onto another quick game that we’ve not played for a while, The Game. This was played with the blue cards from The Game: Extreme, but we just ignored the additional extra icons. In this game, players must try to cooperatively play every card from the deck (numbered two to ninety-nine) onto four piles. On their turn, the active player must play two cards from their hand on any of the four piles: for two of the card must be of higher value than the current top card, while for the other two it must must be of lower value. Players can discuss anything they like so long as nobody discloses any specific number information and they can play as many cards as they like on their turn so long as they play at least two (until the deck has been depleted, after which they must play one). To help eveyone out, there is also the so called “Backwards Rule” which allows players to push a pile back so long as the difference between the card they are playing and the card they are covering is exactly ten. Once the active player has played their cards, they replenish the missing cards. The game ends when all cards have been played or the active player is unable to play a card. This time, a lot of players started with mid-range cards, but once those had been cleared, things progressed quite satisfactorily. Inevitably, when Burgundy was forced to trash a pile, things began to go wrong, but once he’d played all his cards, with a bit of careful organisation all of a sudden it looked possible, and indeed, as Ivory played his last cards, a four and a three, we beat The Game for the first time in a very long while. The game was very close. Purple was clearly doing well with lots of lucrative Soy beans, while Black-eye beans were unusually popular. Black was stuck with a precession of coffee and wax beans, while Blue kept digging up stuff just before she acquired more of them. Burgundy kept complaining that he had a very small pile, but by the end it looked just as healthy as anyone else’s. Blue bought herself a third bean field at her first opportunity, and, controversially, Ivory followed about two thirds of the way through the second round. This drew lots of surprised gasps and sucking of teeth, as the received wisdom is that with large numbers of players, the extra field is rarely worth it. It was impossible to tell whether Ivory would have done better without it, but it was a game of small margins. In the end, it was a tie, with Blue and Purple both finishing with thirteen points, largely thanks to a very dodgy trade on the final turn. Learning Outcome: Great games can come from a simple rule set. 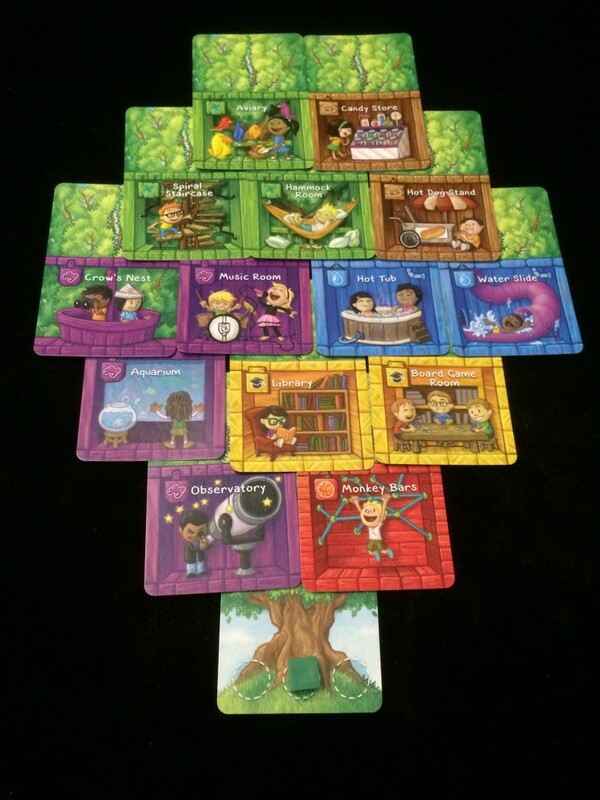 This entry was posted in Games Night and tagged 6 Nimmt!, Best Treehouse Ever, Bohnanza, Carcassonne, Dodekka, Love Letter, NMBR 9, Taluva, Taluva Extension, The Game, The Game: Extreme on June 12, 2018 by nannyGOAT.